DIY Waxed jeans – Flux. 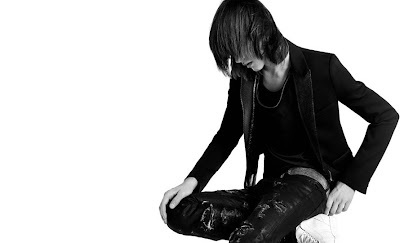 Waxed/black coated jeans have been around for awhile, for example Acne and Dior Homme have made their own version of these jeans. I never owned a pair due to the fact that the price was ridiculously high and none of the waxed jeans fit me. My boyfriend on the other hand has had two pairs of Acne Hex Cash black coated jeans, and even though he hasn’t ever washed them in a washing machine, the top coat has already totally worn out. I have always wondered how on earth they do that cool wax/black coat surface, so I really wanted to get into the bottom of this mystery. My boyfriend and I figured out that the paint Acne may use is acrylic paint, so we walked into the artist shop that was around the corner and did some shopping. What we found was black acrylic paint and some gloss to mix in with the paint. So, we took the stuff home and started painting the jeans with the mix and were pretty pleased with the outcome. Here are detailed instructions on how to make your own waxed jeans, how much it costs, and what you will need. I will also reveal the results of this denim makeover (see the pictures). I chose to give the makeover to some old Cheap Mondays and my boyfriend did it to his worn out Acne’s. 1. The jeans – Since the paint dries out really hard you should use jeans that have lost their form or are a size or two bigger than usual. Otherwise you may not fit in your jeans after the makeover. 2. The Paint – Get black (or whatever color) acrylic paint, a brush that’s made for acrylic paint and if you want to add more shine to the look, get some soft gel gloss to mix in. You will also need a cup where you mix the paint and probably some cardboard to protect your floor. Art stores sell these supplies and are willing to help, just ask them. There are cheap and expensive paint options, depends how much you’re willing to spend on your project. The black paint we purchased is called Wilson & Newton: Galleria Acrylic paint, 13€. The gloss was by Golden and it is called Gel Medium Soft Gel (Gloss), 10.70€. These were huge bottles, so we could do this operation about 10 times if we wanted to. 3. Mixing the paint – Mix about 80% acrylic paint and 20% of the gloss. If you want more shiny look, add more gloss. If you want to thin then paint, add water. 4. 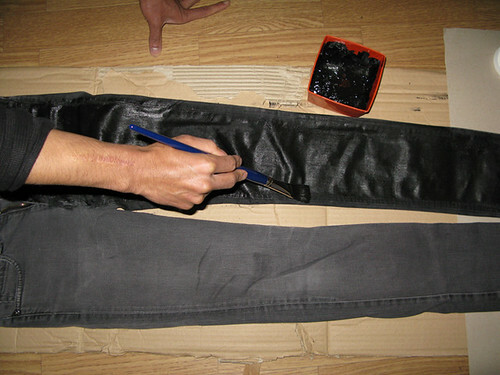 The Paint job – Place your jeans on the floor on top the protective cardboard (or plastic). Start painting the jeans with the paint brush. Use mild strokes along the lines of the denim. You can do as many layers as you want, if you feel that the jeans didn’t get the result you wanted. My boyfriend did two layers, I did just one because I wanted a bit more rougher look. Acrylic paint dries really quickly, so you can do both sides in about one hour. After finishing both sides, let the jeans dry a few hours before trying them on, just to be sure. My boyfriend working on his jeans. 5. Ta dah! – Now you got yourself some waxed jeans. Pullinging them on is like putting on jeans made out of paper, so be patient and careful. With heavy use the jeans will soften up and get more comfortable, trust me on this one. 6. Washing instructions – I don’t recommend that you wash your jeans but if you absolutely must, do it in cold water without any soap. I’m warning you though, the color will bleed! If you can, take the jeans to a dry cleaner. 7. Wear your jeans – There you got yourself a cool new pair of waxed jeans. Go on and wear them! Next Post Greetings from the land of fjords! Hey thank you very much for this tutorial! Ever since I saw my fave photographer ryan McGinley sporting those Dior Homme jeans in Vice Magazine i’ve been wondering how to Do It Myself! What an awesome idea. I never would have thought of it! Thanks. Awesome tips! They look hot! Sugar kane: NP. Yeah those DH ones are deffo amazing, its good that the secret is out finally. :)Hanna: Kiitti. Kannattaa kokeilla sellaisilla farkuilla, joilla ei ole väliä meneekö pilalle vai ei.Aina: Kiitti!Eve: Onnea matkaan!Lucy fashion: Sure I can and thanks. :)Nelliina: Niistä vaan lopulta lähtee ne vahat pois, mutta tuossa on keino restauroida ne kuntoon.Heidi: Kiitti, jahas täytyykin kokeilla pesemistä. :)Suhkur: Ne ei tavallaan pienene, mutta tulevat niin kovaksi, että jalkaan laittaminen on vaikeaa. Eli ne tavallaan pienenee yhden koon. Kyllä ne sitten käytössä venyy takasin. :)I: Me neither hehehe. :)Tres lola: Thanks! Hei!Tuli mieleen, että irtoaako farkuista maalia käytössä? voiko huoletta istua vaalealle penkille? WAY too much effort for me but it looks great! this is probably the coolest diy i have ever seen! this is brilliant! i may have to give it a try. do you have to start with black jeans though? this is very cool. by the way, i am more into the transparent wax coating by dior homme few seasons ago. do you have idea about what material to use? i have no idea yet. Thanks for posting this – I have a pair of the Urban Outfitters black wax jeans and oops washed them in the machine and now they are just boring black pants with no special finish. I’m going to try this – yours look great. finally done my clear waxed version using only acrylic medium, use “regular gel” as the base layer, because it is less watery than tar gel or clear gel, then you can add layer or tar gel or clear gel for smoothness and glossiness. check ouot the photo on my blog, MOCK DIARY. is it possible for me to show u guys wat i meant? and perhaps get some advice on how to cover the patches?P.S i did coat quite a number of times.. but i just couldnt get the shiny/glossy look .. but the jeans does feel stiff.. ironically jus like my other waxed jeans! Keav: Please do, you can email me some pics if you want at fluxorist@hotmail.comFusedlights: It’s just because I didnt want to do so many layers on my jeans. My bf did 2 or 3 times the layer and his have a very smooth finish. I wanted mine to look a bit unfinished and cracking and those pictures were actually taken right after I finished them. The paint does not crack or fall off when you move in your jeans but if you wash them, it might wear out a little. I haven’t washed mine yet, so I don’t know. Usually you should not wash your waxed jeans, even if they are store bought. Good luck with the project! what a brilliant idea! your jeans look perfect!! BRILLIANT! i'm gonna try it!!!!!! thanks thanks thankss! :)great DIY project i might say! You have a slight typo on number 5: You are pulling the jeans on, not pullinging. Just wanted to point it out! :)I want to try this ASAP. Are the jeans hot in the summertime? Vau, totahan voisi kokeilla johonkin takkiin :DIte oon pentuna painanut isoja kirjaimia farkkujen reiteen ihan perus akryylimaalilla ja ne farkut kävi useamman kerran pesukoneessa ihan tavallisilla pesuohjelmilla, eikä tekstille käyny mitään. Kuivuttuaanhan akryylimaali on teknisesti ottaen muovia. Ohuella kankaalla pinta saattais halkeilla, mutta ei se kyllä lähde millään pesuaineella. PLEASE TAKE THIS DOWN< YOU ARE A FASHION DESIGNERS WORST NIGHTMARE!!!!!!! Thanks so much for posting! I made a pair of shorts with fabric paint, a foam brush and your instructions and they look just fabulous! if i coat the jeans from indigo to a black waxed a few months. can i reverse the effects and bring it back to its original indigo colour?? someone help me. i coated mine black. Anonymous: I highly doubt it.. perhaps you can find out if there is any chemical that washes off acrylic paint (if that's what you used)? Other than that, I doubt it's reversible because the paint does not come off in normal wash, I heard. yes i used acrylic paint gels. coated it and used them for a bout 4 months. washing it now helps?? or do i need to use something else?? Anonymous: Well, I quickly googled "how to remove acrylic paint" and this what I found: http://www.ehow.com/how_2285673_remove-acrylic-paint.htmlhttp://www.thefrugallife.com/acrylic_paint.htmlPerhaps these tricks will help? If not, I suggest just getting a new pair of blue jeans. OMFG. You are an absolute heaven sent! Stuff paying hundreds on a pair of Dior Homme jeans. I'll just wax coat my worn out Nudie Jeans! Well done. I'd give you a big kiss if I could. HAHA! Platee: No problem, I'm glad I could be of help. :)Anonymous: Awws, that's so sweet! I'm so happy to hear that you like the tutorial. 😉 Hopefully your waxing project went well! OMG I LOV LOVE LOVE THIS…Just hit upthe art store and got my supplies, cant wait to see how my jacket turns out!!! Where are pictures of your boyfriend in his? Hi I am from Singapore. I couldn’t get that brand of gel golden here. Will Daler rowney varnish gloss gel do the job? I don’t know what to get man. Can someone help? i went to the supply shop. They are very confuse. So i ask for Medium Gloss gel? to be exact? I have a couple pairs of Notify waxed jeans and I love them so much, the gloss is about gone. Anyone tried restoring the gloss using Anna Maria’s technique with success? Anyone tried it and want to talk me out of it? Wow! This is an amazing idea. It is a good way to make your old pants to make it look new. It is a very creative thinking. I am sure my friends are going to love this post. What about rain?? are acrylic colors waterproof? Hey Michael and thank for your question. Yes, it is. 🙂 When the paint is completely dry, it’s waterproof. They are not waterproof but they are water resistant hope this helps. You need waxed oilskin to get waterproof. Waxed oilskin is dull and not shinny and and is Beeswax, paraffin wax and boiled linseed oil all melted together and applied. aww..this is so nice.. I try to use clear gloss paint before..but it doesn’t work..perhaps its because the jeans absorb the liquid paint..really thanks for the tutorials..so acrylic paint will help the gloss stay..anyway, can I use other color acrylic paint? like making a burgundy waxed jeans?..haha.. Yeah, that might have been the problem. Acrylic paint won’t do that… If you put just the acrylic paint (ie. black one) it will stay anyways, the gloss will just add more glossiness (shine) to the paint. So basically yeah, if you had a pair of white jeans for example, you could make them burgundy by using a burgundy acrylic paint, if that’s what you want haha. 🙂 If the color on your jeans is fine, you only need to add the gloss, as it just gives a clear glossy surface on the jeans. If they lack of color, then add the desired color paint to the mix. yeah, I made one already..but it seems that I somehow didnt managed to put the correct amount of acrylic on it..it become a bit rough on the surface. but after I sandpaper some of it, it feels fine :)..
haha, I think I haven’t brave enough to wear burgundy coated jeans..so I go with blue-ish grey. and It turns out good..thanks ! haha..you should try to be a burgundy gothic ninja one day :p..
well, after three days of usage, just like you said, it become softer :)..which is good..but the glossy surface start to seems messy. :(..my bad painting skill perhaps..cant get the perfect waxed like dior homme one..
btw, just out of my curiosity, you know nudie jeans has something called dry black coated, and interestingly it gets more and more glossy after usage..which I found it surprising.well I never found one which is glossy enough to be like mirror though, so I guess it will stop become more glossy at certain point :p.. any idea how they do that? and nudie jeans has another dry coated variant, which is grey coated and ultra indigo coated..however, different from the black one, this two sibling will fades in color as well, where people said the black one will not unless you wash it..
is it just the wrong information I got? I think I put too much gloss into the mix and my jeans turned out waaay too glossy…how can I remove the paint or make it less shiny?? I’m not sure.. Maybe paint thinner might soften it up? This is absolutely jeanius. I just painted my old Dr Denims (%30 gloss %70 paint), the wax had long gone and they have come up fantastically. Thanks alot for that, you saved me $200. Thank you for your nice comment. I’m so happy to hear that they turned out great. Enjoy your newly refreshed jeans! I was wondering if this project would with if I wanted to make my jeans metallic gold or silver ? Where can you buy the gloss and acrylic?? I bought mine from a local art supply store. Also some bigger department stores might have the latex based furniture paint, which is also great! But does it stick after drying the acrylic paint? Kindly advice me, thanks a lot in advance.